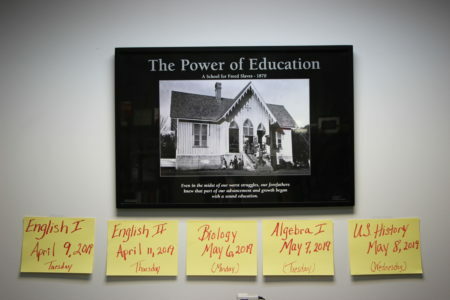 Worthing High was one of 10 Houston schools that had to improve — or they’d be closed or trigger a state takeover of the whole district, because of the state law known as HB 1842. 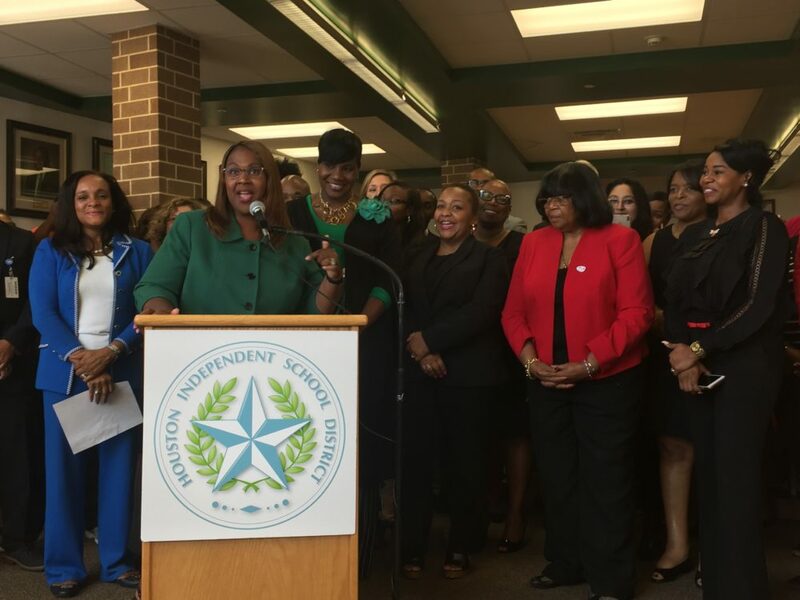 HISD’s interim superintendent Grenita Lathan pointed to double digit improvement on tests that pushed Worthing High from “improvement required” to “met standard” for the first time in seven years. 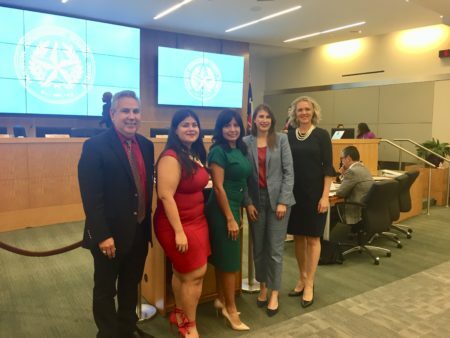 The Houston Independent School District (HISD) has avoided tough state sanctions, as all of its most struggling school showed academic gains — or received a waiver on accountability ratings because of Hurricane Harvey’s impact. It was a cause for major celebration at Worthing High School. The campus — a cornerstone in Houston’s predominantly black neighborhood of Sunnyside — got a passing grade from the state for the first time in seven years. Over 100 people, including teachers, district administrators and elected officials, crammed into the school’s library to commend the school. That pressure is off for now, since all 10 improved or got a waiver due to Hurricane Harvey. Along with Worthing, five other schools chronically rated as “improvement required” met the state’s standard: Woodson PK-8 and also Blackshear, Dogan, Mading and Wesley elementary schools. Four other chronically failing schools that received waivers get a pause on accountability because of Harvey: Highland Heights Elementary School, Henry Middle School and Kashmere and Wheatley high schools. 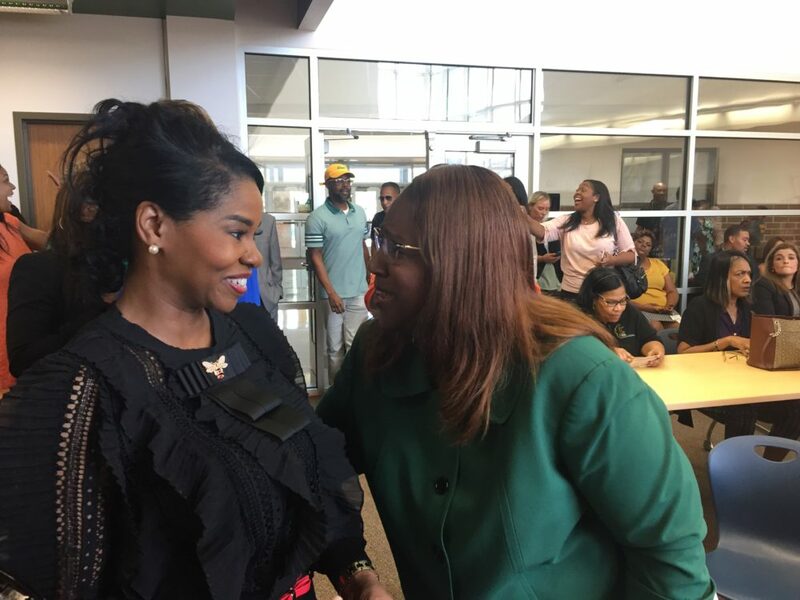 Interim Superintendent Grenita Lathan said that the Houston district is headed in the right direction, but she wants to build up trust with the community and is focused on continued improvement. Interim superintendent Grenita Lathan and Worthing’s principal, Khalilah Campbell-Rhone, celebrate the school’s improvement. 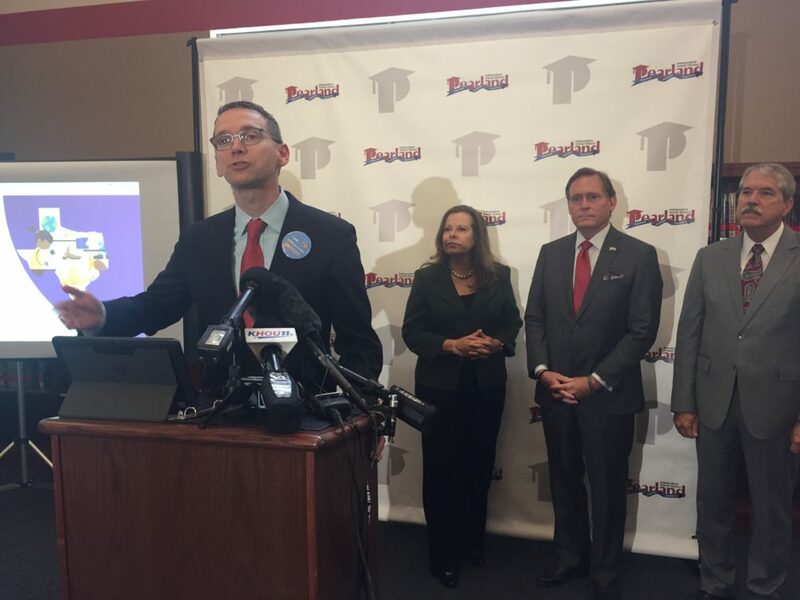 Because of that work, the state’s Education Commissioner Mike Morath told Houston Public Media that the state’s conservator will likely continue to oversee some Houston schools. While individual schools got pass or fail ratings, the Texas Education Agency (TEA) handed out new reports cards Wednesday, with grades on a scale of A to F, to Texas districts. HISD, along with many Houston area districts, was not graded on the new system, again because Hurricane Harvey delayed class, displaced teachers and students and caused other hardship. Still, the TEA said that its calculations show that Houston would have earned a “B” grade, if graded. HISD Board President Rhonda Skillern-Jones touted that. 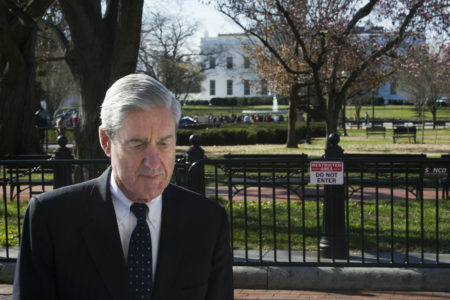 “Despite Harvey, despite lowered funding, despite deficits, despite state sanctions, despite all of the horrible that happened, we still would have been rated “B” rating. But in my book, we’re an A-plus,” Skillern-Jones said. Lathan said that she has reservations about the new report cards. 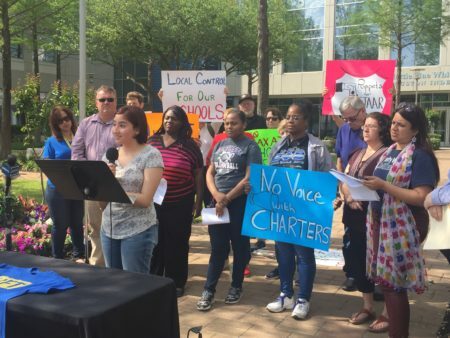 Many educators, including the Texas Association of School Administrators, have come out against the system that’s polarized the Texas education landscape. “We have concerns as it relates to utilizing one test, one day in time or one moment in time to rate our schools because you don’t know the true story of a campus, for example, of a campus like Worthing and all of the work that goes into ensuring that students are growing, so we do have concerns,” Lathan said. Texas’ Education Commissioner Mike Morath highlighted Pearland ISD as a district to learn from during a visit Wednesday, Aug. 15, 2018. Pearland ISD earned an A grade from the state. In a visit to greater Houston, the state’s education commissioner Mike Morath pushed back against that kind of criticism. He told reporters that superintendents who disagree with the rating system care about children, but that they analyze student performance differently. “This is clearly the fairest accountability system in the history of the state of Texas in terms of getting districts the credit for school progress or student achievement, which has never been done before and we use measures that really matter for kids,” Morath said. He gave high credit to the Pearland Independent School District for its “A” grade — something that only about 18 percent of Texas districts made. For school districts that got low marks, Morath said that those rankings shouldn’t stigmatize students enrolled there. “These are not value judgments about students, these are summative ratings of performance about how we’ve supported students and we need to use this information to get better and get stronger,” he added. Parents and teachers can check out their school district’s rating at txschools.org. While this year districts got letter grades, next year individual schools will also get the A-F report cards.